FILE - Indian activists carry placards of the leader of the Pakistan-based Jaish-e-Mohammad group, Masood Azhar, during a protest denouncing an attack on the Indian air force base in Pathankot, in Mumbai, India, Jan. 4, 2016. The European Union is reportedly contemplating designating the leader of Pakistan-based militant group Jaish-e-Mohammad (JeM) a terrorist. The EU's decision comes nearly a week after a push by France and India to declare JeM leader Masood Azhar a terrorist and freeze his assets. JeM is already a U.S.- and U.N.-designated terror group. Azhar is an Islamist extremist who wants to end Indian control of a portion of the disputed Kashmir area and merge it with Pakistan. He was born in 1968 in Pakistan's Punjab province in a Deobandi (Sunni sect) Muslim family. He reportedly received his early education in Bahawalpur, Punjab, and later enrolled in Jamia-ul-Uloom, an Islamic seminary in Karachi, where he became a teacher. Azhar founded Jaish-e-Mohammad in 2000 and maintained his affiliation with several terror groups, including al-Qaida, Hurkat-ul-Mujahideen (HuM) and Harkat-ul-Ansar (HuA), all U.S.-designated terror groups. JeM is believed to be based in the Peshawar region of Pakistan's Khyber Pakhtunkhwa province and in Muzaffarabad, the capital of Pakistani-administered Kashmir. Azhar received his militant training in Afghanistan in the 1980s and fought Soviet troops there. 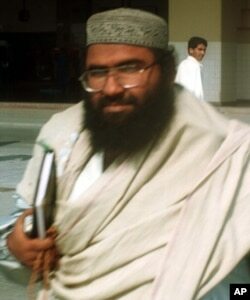 FILE - Muslim cleric Masood Azhar arrives at Karachi airport, Jan. 22, 2000. Azhar reportedly traveled to Afghanistan in 1988 with his brother, Ibrahim Azhar, who according to analysts played a key role in shaping Masood's religious ideology. "Azhar himself mentioned in one of the articles that his inclination towards jihad started when Mufti Nizamuddin Shamzai, head of the Karachi Jamia-ul-Uloom at that time, issued an Islamic decree for students to go and participate in Afghan jihad," Mujahid Hussain, an author and expert on terror outfits, told VOA. It was during his time in Afghanistan that Azhar developed a relationship with al-Qaida and its leadership, and later worked closely with the terror group. Azhar traveled to several countries, including Britain, Saudi Arabia, Zambia, India and Bangladesh, to raise funds and recruit youth toward jihad. He has written over 20 books on Islamic history and the importance of jihad. Azhar's current whereabouts are unknown. Some experts in Pakistan believe he is living in Bahawalpur, a city in southern Punjab. "I personally know many people who have met Azhar in Bahawalpur. Azhar reportedly goes to the mosques, gives sermons and greets people. And he continues to write for JeM's magazine," Hussain said. On Feb. 5, when various religious parties throughout Pakistan marked Kashmir Day, an audio clip of Azhar was played during a JeM rally in Karachi. In the audio, Azhar invited people toward jihad. "Stay determined," he said. "And instead of going one by one, if you all go out there together as a group, India won't be able to stand us for even one month." VOA Urdu's Sarah Hassan contributed to this report.